Mountain climbing season is almost here! Ok, so technically it's not; it's only mid January but the warm weather here in California has gotten me in the mindset to start training. And this year, I want to really focus on a proper training plan as opposed to years past when I relied mostly on core fitness and guts (foolishness) to get me through my adventures. So far for the coming season, I have several concrete trip plans as well as several back burner project peaks to summit. But the main focus this year is probably going to be a pair of trips to Mt. Whitney. This mountain in particular has become somewhat of a mountaineering cliche over the last few years. The sheer number of climbers makes it seem like the Disneyland of the Eastern Sierra; the very mention of climbing it can draw dirty looks from self proclaimed "serious" alpinists. I have climbed Mt. Whitney before, but it has been nearly ten years since my last climb and it seems like it's time to go once again. I'm not sure what it is that draws me back now; the allure of that mountain and the beautiful area surrounding it is mystically intoxicating. My goal this time around will be to explore a route that I haven't experienced before: the Mountaineer's Route. 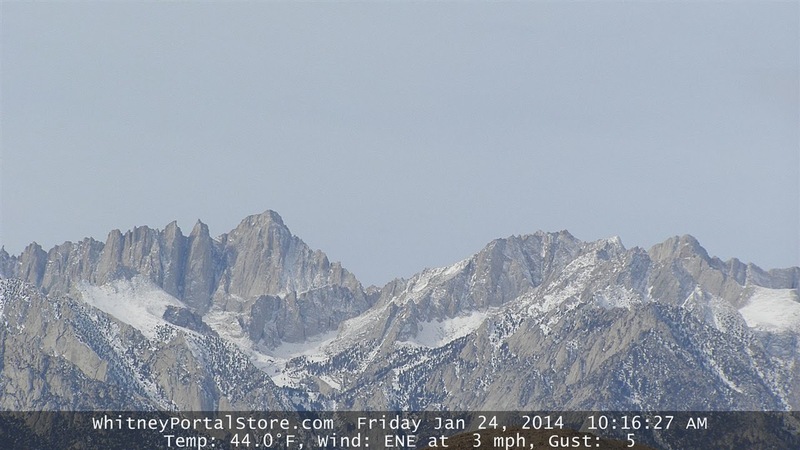 The last time I climbed Whitney was via the much more traveled main trail. Now, the plan will be to climb the shorter, but more technically and physically challenging path; and to do it solo. I chose a solo attempt for my first trip because quite frankly none of my friends thinks hauling their behinds up a 14,000 ft. peak in the wee hours of the morning for a single day attempt is any fun. I, on the other hand, am a glutton for physical punishment and think it's fun; a lot of fun. 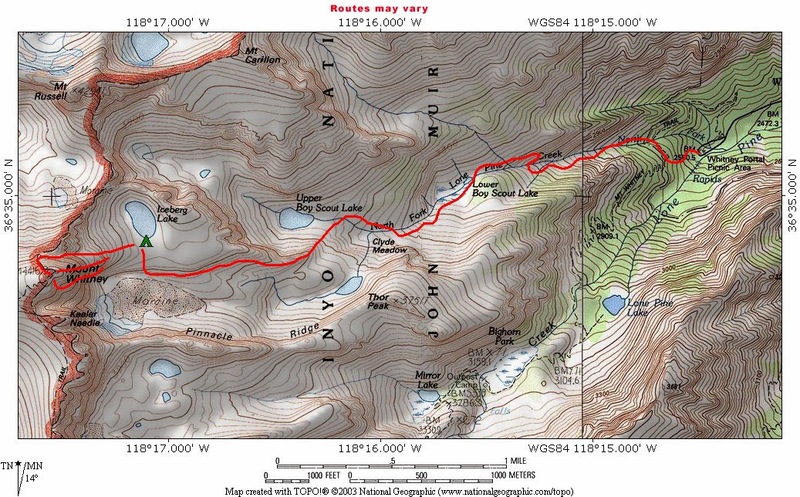 Topo Map showing the approximate path followed by the Mounatineer's Route. The second trip to Mt. Whitney has been much less of a planned affair from the start. In passing I had mentioned to my father that we should give it a shot this year. He has never climbed the peak and I incorrectly assumed he had all but given up on tackling the summit. But to my surprise, he agreed to an overnight attempt of the main trail or maybe even the Mountaineer's Route. Now, my dad is hardly your typical retired 60-something-year-old. He has a pacemaker, and has had one for the past 30 years or so. In fact, he is the longest surviving pacemaker recipient in the world. Not to let this type of thing stop him, he is an avid cyclist who rides centuries and 200+ mile weeks on a regular basis, which is more mileage than I do! So, in all reality he should not have too much difficulty climbing the mountain. You can probably start to see where I get my athletic lunacy from here. The Permit Dilemma: Not Everyone Gets to Climb the Mountain! Now that we have the makings of a few trips, we need to get down to the hard reality of planning and actually pulling off these trips. Due to the volume of people wanting the climb the mountain, the forest service has instituted a quota system on people entering the "Mt. Whitney wilderness zone" for single day and overnight trips. What this means is that you will need to have a permit to climb the Mt. Whitney trail, and that there are not enough permits to go around during peak season. The way to get permits is by entering the permit lottery. Lottery applications begin February 1st at www.recreation.gov and end on March 15. The permits available during the lottery cover both single day and multi-day trips along the Whitney Trail, as well as day trips on the Mountaineer's Route. And here is where a nice little loophole entered my calculations. My solo trip up the Mountaineer's Route requires a permit so I will be forced to enter the lottery and sweat it out with everyone else. However, multi-day trips on the Mountaineer's Route are not subject to the lottery since a majority of the route is outside the "Whitney zone". Why this condition applies to only the overnight and not the single day permits is beyond me...most likely the forest service has some very complicated reason for doing this. At any rate, there is still a daily quota of 100 people, but you can reserve them up to six months to the day in advance on a first come, first serve basis. Taking advantage of this, I procured a permit for two nights on the Mountaineer's Route for the overnight trip so that my father and I are assured of at least having a permit. The plan is to back up those dates with a main trail permit lottery application so we might have more route options. Unfortunately, the main trail overnight permits are the most sought after and so the likelihood of obtaining a permit on the same date is far from certain. So, it looks like there is a very strong chance I will be doing the Mountaineer's Route twice this year. Awesome! With the permit situation covered, at least until the lottery applications are open, I turned to advance planning and training to get into mountain shape for the season this year. One of the common concerns each year is snow on the trails and how it will affect your climb. For the main trail, snow and ice is not a good thing; it makes the infamous 99 switchbacks to trail crest hazardous and unpleasant. The Mountaineer's Route, however, can benefit from a good snow pack in early summer by improving climbing conditions over several sections of fallen, broken rock known as scree. Climbing over the scree is like trying to climb a sand dune; you take one step up and slide back two steps. What the snow does, is hold everything in place and allow you to cut in nice, clean steps making life much more pleasant. You will need crampons and an ice axe to do this, but even this extra weight is much better than the alternative. Unfortunately, if the snowfall so far this season is any indication, snow won't be a factor. Somehow, I don't think snow will factor into the equation. A second, less obvious effect of the thin snowpack this season may be limited availability of water on the route. Normally, there are really only three reliable sources of water close to the trail: Iceberg Lake, Upper Boyscout Lake, and Lone Pine Creek. A fourth, but far less attractive option is Frog Pond; it is smaller and even more seasonally dependent, as well as farther from the trail making it an iffy water source at times. If water levels are low, the available water that the three main sources offer may be of extremely poor quality, even if filtered and treated. This would mean that additional water would need to be carried in, thus creating a significant weight issue. Based on the chart I created in the first installment of The Beginner Hiking Series 1: Getting Started, and adding some extra to account for the altitude, you would need around 18 liters of water for the expected two day expedition in the 40F-90F temperature range that normally occurs in June on the mountain. This would mean a water load of nearly 40 pounds! Even on the shorter duration one day push, a realistic water requirement would be 10-12 liters; which still would mean 20-25 pounds of water. While these numbers may seem rather high for water intake, an important thing to remember is that dehydration is one of the major contributors to the onset of altitude sickness symptoms. The dry mountain air and extreme exertion mean you will need to replace at least 3/4 liters of water per hour to stay properly hydrated. Cooking water will also need to be considered on the two day trip, as that water will subtract away from the drinking water totals. The only thing to do at this point is to hope that water will be available in June, which with any luck it will be. Water consumption is a serious concern at altitude, this chart reflects a minimum number at altitudes above 10,000 Ft. This far in advance, training really needs to focus on base fitness and overall strength. Intensive training and altitude conditioning this far out will only cause you to "peak" early and you will have trouble maintaining that level of fitness all the way until the trip. With nearly six months to train, I am personally focusing on cardio fitness and leg strength. Both my dad and I are pretty serious cyclists, so our overall level of fitness is much higher than the average person. Because of this, I tailored our training to continue cycling at a normal pace for the next three to four months to maintain where we are physically. I personally want to focus most of my development in my overall climbing leg strength. Running and cycling use different muscle groups that the typical 'stair stepping' motion used in mountaineering, which is going to be a major component of the climb. To help overcome this deficiency, I am working into our training a lot of weighted stair exercises and hikes to build those groups up. A sample of my weekly training plan for the next three months is listed below. Squats, lunges and wall sits: 3 times per week. 30 reps each. As you can see, this training schedule is designed to keep my cardio fitness level more or less intact for the next few months, as well as develop my legs for climbing. I also include hang bar workouts to strengthen my core muscles, which will help with supporting the weight of my pack, as well as increase my overall balance on the climb. With this initial planning foundation, I will need to begin intensive study of the route to ensure that I'm able to find my way along the correct path, even while at altitude. Additionally, I will begin selecting gear required for the trip and continue the training schedule until it's time to ramp up to more intensive workouts. Then will come some altitude training to begin building up my reserve of red blood cells so I will be better able to function at altitude (I live right at sea level). All these subjects and more will be covered in future posts in this series, so stay tuned.